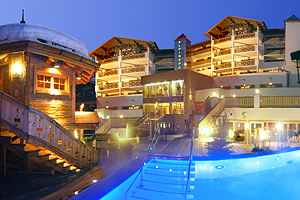 Hotel Alpine Palace, nestled in the Austrian Alps, offers 5 Star luxury living in Saalbach Hinterglemm in the Salzburg province of Austria. Right in the heart of the mountains, the hotel is the perfect starting point for your winter skiing, or summer mountain hiking holiday. 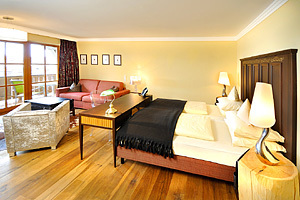 Staying in one of the luxury rooms or suites decorated in a modern, sophisticated Alpine style, you will enjoy the utmost comfort. 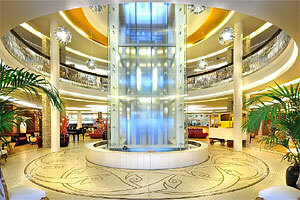 Click here for a 360 degrees panorama application of Hotel Alpine Palace. 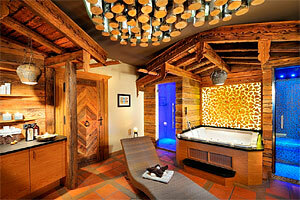 After a day in the great outdoors, relax in the 1500 m² Spa. With heated loungers, a large variety of saunas, outdoor salt-water pool and whirlpool plus original and intriguing relaxation rooms, you can immerse yourself in a world of tranquility and wellbeing. If you′d like even more pampering, then visit the 400 m² beauty area and enjoy a massage, facial, pedicure, manicure or make-over with top quality products such as Alpienne, Decléor, Fuhlendorf and Phytomer. 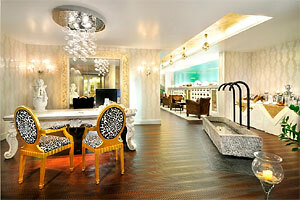 And for radiance from within, enjoy a good workout on the latest Technogym equipment in the fitness centre. For holistic wellbeing, visit the hotel′s Institute for Vitality Medicine and receive expert advice on improving your current health. Arrive at Hotel Alpine Palace like a king! With the hotel′s own helicopter service you can be picked up from the airport by the hotel′s owner himself! Or take a pleasure trip over the mountains and marvel at the spectacular views. Such a magnificent experience is bound to work up an appetite so on your return enjoy delicious cuisine in our charming restaurant. After a tasty meal and maybe a cocktail at the bar, why not head down to the card casino and try your luck at a game of poker. The card casino is a popular destination for poker tournaments but for other events and functions the hotel′s function & conference rooms offer bright and spacious surroundings and the latest in presentation technology. 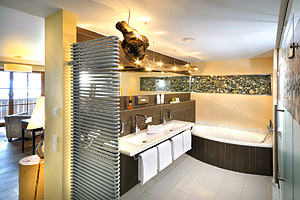 In winter Saalbach Hinterglemm is buzzing with skiing enthusiasts and the premier address to stay at is Alpine Palace. With cable car, ski school & ski hire plus snowboarding, tobogganing, cross-country skiing and ice-karting all on the hotel′s doorstep, you are sure to find something to enjoy! Plus winter special offers make your holiday especially great. Hotel Alpine Palace is also fun for kids. With childcare and kid′s entertainment programme, a room for them to hang out in plus even wellness for kids, they will not be bored. In the summer the area is perfect for hiking and excursions to nearby adventure parks, high ropes course, mines and museums will keep the whole family amused. 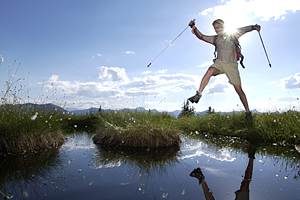 Summer special offers for golf enthusiasts, families, mountain bike fans and hikers offer a package of activities for the perfect holiday in Austria.